On behalf of the entire staff and Board of The Joshua Fund, allow me to wish all of our Jewish friends — in Israel and around the world — a happy and blessed Chanukah holiday season. ‘Tis the season to remember the miracle of what the Lord did to protect the Jewish people from her enemies in ancient times, and give her light when it seemed that the light was about to be extinguished. As many of you know, I’ve just returned from two weeks in Israel with several of our Joshua Fund team. I look forward to reporting soon on some of the key things I learned and heard on that trip. For now, though, I just want to express my thanksgiving for your faithful prayers and financial support of this ministry. We are seeing so many Jews and Arabs blessed and encouraged in so many practical and personal ways by the unconditional love of Christians from all over the world. Thank you so much for being part of this ministry. I hope you’ll take some time to learn more about this important Jewish holiday, and take some time to pray for the peace of Jerusalem and for the Lord to show His grace and mercy to Israel and the Jewish people, as well as to Israel’s Arab and Persian neighbors and enemies. God loves all the people of the Middle East, not just one side or the other. Here is an excellent one-page summary of the Chanukah story you can print off an read to your children and family. The Feast of Dedication – Chanukah (Hanukkah) that literally means “Dedication”– is celebrated in 2013 beginning at sundown Wednesday, November 27th and continuing through Thursday, December 5th. The history of Chanukah began with the capturing of Judea by Alexander the Great, who had conquered most of the ancient world of the Eastern Mediterranean. As the generals of Alexander the Great’s army divided up the empire after the conquest, the area of Judea came under the control of Antiochus IV Epiphanies. Antiochus tried to force the Jews to accept the Greek culture, even resorting to defiling the Temple by erecting a statue of the god Zeus in the Holies of Holies. The Jewish people revolted and fought a courageous war to drive out the Greeks sometime around 163 B.C. The Jewish people were then able to enter the city and worship in their Temple. Thus began the Feast of Dedication which celebrates the great deliverance of the Jewish people from their oppressors and the dedication of the newly cleansed Temple. Jewish tradition states that there was only a one-day supply of the special oil that was burned in the Temple menorah, and the process to make more would take eight full days. As the people lit the menorah on the first day, and the oil miraculously burned for eight days while more was being prepared. 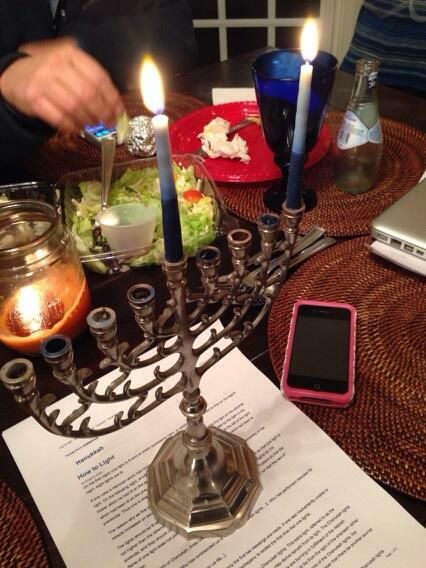 Today, Chanukah is celebrated with a nine branch candelabra or menorah. The eight branches recall the eight days the oil burned miraculously, while the ninth is the servant candle that is used to light the other candles. Each evening during the eight-day feast, one more candle is lit – one the first night, two the second night – until all eight candles plus the servant candle are burning brightly on the last night. The servant candle is called the “Shamash,” and literally means “makes use possible.” Chanukah, also called the Festival of Lights, is often accompanied by the giving of gifts. One quick interesting factoid about Chanukah: This holiday is not mentioned in the Old Testament. That’s because the battles between the Jews and the Greeks, and the miracle of the oil, took place after the canon of the Old Scripture was completed. Yet, this holiday — the “Feast of Dedication” — is actually mentioned in the New Testament. In John 10:22 and the following verses, we see that Jesus was in Jerusalem to celebrate this Jewish Feast with His disciples. >> To learn more about The Joshua Fund — who we are and what we do — please visit our website, www.joshuafund.net. Listen to Damascus Countdown as an audio book. I can’t say I’m sure Halevi is correct, that an Israeli strike is now “inevitable,” but I thought these were comments worth you seeing. “I think it’s a betrayal. The Obama administration had to be dragged into supporting sanctions. It took the administration three years to sign up for crippling sanctions. And now, just as they’re starting to work, the administration is beginning to dismantle the system. That’s a betrayal. “They are laying the groundwork for another North Korea. One way or another, they [Iranians] are going to reach the finish line. They’re either going to do it through subterfuge, or by pocketing the gains from this deal and then not moving forward to the final status agreement and then daring the international community not to implement the sanctions…. 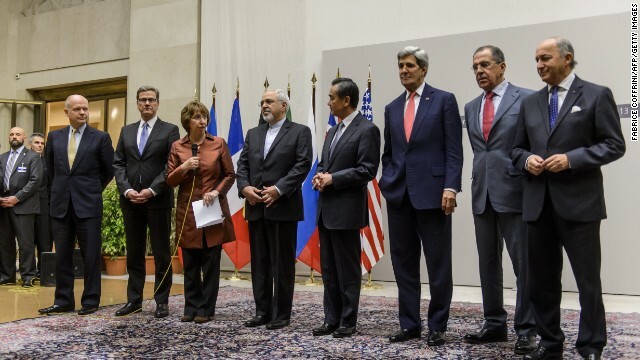 “Before this deal, there were two credible threats to a nuclear Iran. One was the sanctions effort, and the other was a Israeli strike. 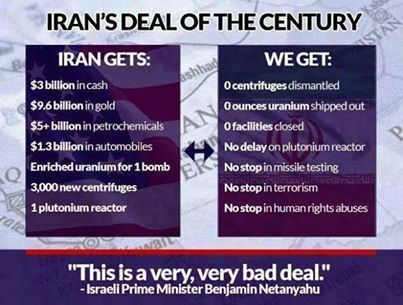 The deal with Iran undercuts both. If Israel doesn’t strike, Iran will go nuclear. 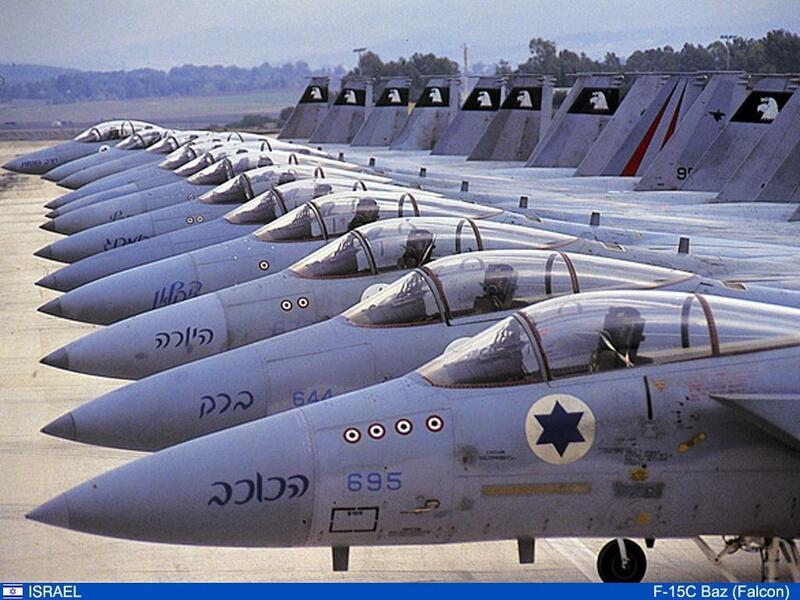 And the price of an Israeli strike has now has risen exponentially. “If you’re going to make a deal, this is the best deal they could make. But there should not have been a deal. The Iranian regime was being cornered. Sanctions might even have brought about the fall of the regime. This is an unthinkable surrender. “Obama has created a condition in which Iran will be gradually reaccepted into the international community, and Israel could well find itself a pariah. That’s Obama’s gift to the Jewish people. 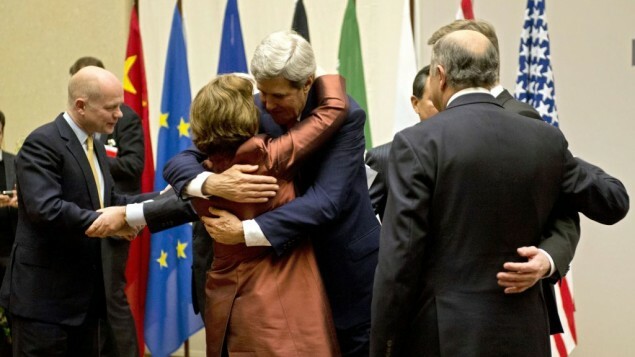 The Iranian nuclear deal is done. Here’s what it says. Full text. The goal for these negotiations is to reach a mutually-agreed long-term comprehensive solution that would ensure Iranˈs nuclear program will be exclusively peaceful. Iran reaffirms that under no circumstances will Iran ever seek or develop any nuclear weapons. This comprehensive solution would build on these initial measures and result in a final step for a period to be agreed upon and the resolution of concerns. This comprehensive solution would enable Iran to fully enjoy its right to nuclear energy for peaceful purposes under the relevant articles of the NPT in conformity with its obligations therein. This comprehensive solution would involve a mutually defined enrichment program with practical limits and transparency measures to ensure the peaceful nature of the program. This comprehensive solution would constitute an integrated whole where nothing is agreed until everything is agreed. This comprehensive solution would involve a reciprocal, step-by step process, and would produce the comprehensive lifting of all UN Security Council sanctions, as well as multilateral and national sanctions related to Iranˈs nuclear program. There would be additional steps in between the initial measures and the final step, including, among other things, addressing the UN Security Council resolutions, with a view toward bringing to a satisfactory conclusion the UN Security Councilˈs consideration of this matter. The E3+3 and Iran will be responsible for conclusion and implementation of mutual near-term measures and the comprehensive solution in good faith. A Joint Commission of E3/EU+3 and Iran will be established to monitor the implementation of the near-term measures and address issues that may arise, with the IAEA responsible for verification of nuclear-related measures. The Joint Commission will work with the IAEA to facilitate resolution of past and present issues of concern. The first step would be time-bound, with a duration of 6 months, and renewable by mutual consent, during which all parties will work to maintain a constructive atmosphere for negotiations in good faith. * From the existing uranium enriched to 20%, retain half as working stock of 20% oxide for fabrication of fuel for the TRR. Dilute the remaining 20% UF6 to no more than 5%. No reconversion line. * Iran announces that it will not enrich uranium over 5% for the duration of the 6 months. * Iran announces that it will not make any further advances of its activities at the Natanz Fuel Enrichment Plant (1), Fordow (2), or the Arak reactor (3), designated by the IAEA as IR-40. * Beginning when the line for conversion of UF6 enriched up to 5% to UO2 is ready, Iran has decided to convert to oxide UF6 newly enriched up to 5% during the 6 month period, as provided in the operational schedule of the conversion plant declared to the IAEA. * No new locations for the enrichment. * Iran will continue its safeguarded R&D practices, including its current enrichment R&D practices, which are not designed for accumulation of the enriched uranium. * No reprocessing or construction of a facility capable of reprocessing. – Provision of specified information to the IAEA, including information on Iranˈs plans for nuclear facilities, a description of each building on each nuclear site, a description of the scale of operations for each location engaged in specified nuclear activities, information on uranium mines and mills, and information on source material. This information would be provided within three months of the adoption of these measures. – Submission of an updated DIQ for the reactor at Arak, designated by the IAEA as the IR-40, to the IAEA. – Steps to agree with the IAEA on conclusion of the Safeguards Approach for the reactor at Arak, designated by the IAEA as the IR-40. – Daily IAEA inspector access when inspectors are not present for the purpose of Design Information Verification, Interim Inventory Verification, Physical Inventory Verification, and unannounced inspections, for the purpose of access to offline surveillance records, at Fordow and Natanz.
. uranium mines and mills. – Pause efforts to further reduce Iranˈs crude oil sales, enabling Iranˈs current customers to purchase their current average amounts of crude oil. Enable the repatriation of an agreed amount of revenue held abroad. For such oil sales, suspend the EU and U.S. sanctions on associated insurance and transportation services.
. Gold and precious metals, as well as sanctions on associated services. • Suspend U.S. sanctions on Iranˈs auto industry, as well as sanctions on associated services. • No new nuclear-related UN Security Council sanctions. • No new EU nuclear-related sanctions. • The U.S. Administration, acting consistent with the respective roles of the President and the Congress, will refrain from imposing new nuclear-related sanctions. • Establish a financial channel to facilitate humanitarian trade for Iranˈs domestic needs using Iranian oil revenues held abroad. Humanitarian trade would be defined as transactions involving food and agricultural products, medicine, medical devices, and medical expenses incurred abroad. This channel would involve specified foreign banks and non-designated Iranian banks to be defined when establishing the channel. b- direct tuition payments to universities and colleges for Iranian students studying abroad, up to an agreed amount for the six month period. • Increase the EU authorisation thresholds for transactions for non-sanctioned trade to an agreed amount. • Have a specified long-term duration to be agreed upon. • Reflect the rights and obligations of parties to the NPT and IAEA Safeguards Agreements. • Comprehensively lift UN Security Council, multilateral and national nuclear-related sanctions, including steps on access in areas of trade, technology, finance, and energy, on a schedule to be agreed upon. • Involve a mutually defined enrichment program with mutually agreed parameters consistent with practical needs, with agreed limits on scope and level of enrichment activities, capacity, where it is carried out, and stocks of enriched uranium, for a period to be agreed upon. • Fully resolve concerns related to the reactor at Arak, designated by the IAEA as the IR-40. No reprocessing or construction of a facility capable of reprocessing. • Fully implement the agreed transparency measures and enhanced monitoring. Ratify and implement the Additional Protocol, consistent with the respective roles of the President and the Majlis (Iranian parliament). • Include international civil nuclear cooperation, including among others, on acquiring modern light water power and research reactors and associated equipment, and the supply of modern nuclear fuel as well as agreed R&D practices. Following successful implementation of the final step of the comprehensive solution for its full duration, the Iranian nuclear program will be treated in the same manner as that of any non-nuclear weapon state party to the NPT. (1) Namely, during the 6 months, Iran will not feed UF6 into the centrifuges installed but not enriching uranium. Not install additional centrifuges. Iran announces that during the first 6 months, it will replace existing centrifuges with centrifuges of the same type. (2) At Fordow, no further enrichment over 5% at 4 cascades now enriching uranium, and not increase enrichment capacity. Not feed UF6 into the other 12 cascades, which would remain in a non-operative state. No interconnections between cascades. Iran announces that during the first 6 months, it will replace existing centrifuges with centrifuges of the same type. (3) Iran announces on concerns related to the construction of the reactor at Arak that for 6 months it will not commission the reactor or transfer fuel or heavy water to the reactor site and will not test additional fuel or produce more fuel for the reactor or install remaining components. (4) Consistent with its plans, Iranˈs centrifuge production during the 6 months will be dedicated to replace damaged machines. (5) ˈSanctions on associated servicesˈ means any service, such as insurance, transportation, or financial, subject to the underlying U.S. or EU sanctions applicable, insofar as each service is related to the underlying sanction and required to facilitate the desired transactions. These services could involve any non-designated Iranian entities. (6) Sanctions relief could involve any non-designated Iranian airlines as well as Iran Air. Analyzing “the deal”: As Iran & White House claim victory, what will Israel & the Saudis do now? UPDATED WITH NEW ARTICLES & COMMENTARY: (Washington, D.C.) — The deal is done. The Iranian leaders are claiming victory. The White House is claiming victory. Most European governments, as well as Russia, are claiming victory. The Israeli government, meanwhile, is horrified. They, and many of their citizens, feel more isolated than ever. As I reported from Jerusalem, this was true before the deal was struck. It is even more true now. “One [Israeli] radio host on Sunday repeatedly played clips of President Obama, during his visit here in March, reassuring Israelis, in Hebrew, that ‘you are not alone,’ and then said ominously, ‘We are in fact alone,'” reported the New York Times. Below, you’ll find a selection of key articles I’ve found helpful over the past 72 hours in understanding the deal and the reaction to it from various quarters. Above all, I encourage you to read the full text of the “interim deal” for yourself, along with President Obama’s statement, the Ayatollah Khamenei’s comments, and Israeli Prime Minister Netanyahu’s comments. These primary source documents will give you the basic facts and contours of the debate. Full text of the Iran nuclear deal. What will the Saudis do now? What will the Israelis do now? The Saudis have been signaling in recent weeks that they are losing confidence in their alliance with the U.S., they are increasingly prepared to buy nuclear weapons from Pakistan, and they might even create a tacit alliance with Israel and the Gulf states as a bulwark against Iran. Is all that bluster, or is Riyadh serious? Meanwhile, the initial consensus among most Mideast analysts is that Israel is now constrained from launching preemptive military strike lest the Netanyahu government risk a massive backlash from the international community that has just agreed to an “interim” agreement with Iran, pending a “comprehensive” agreement in 2014. I have posted a few examples of such views below. But I’ve also posted several examples of Israelis saying this deal makes a preemptive strike more likely, and possibly even inevitable, especially if the Saudis will help. Is this true, or just the bluster of those frustrated by what they perceive as the world’s betrayal? To be candid, I don’t have the answers to these questions. Not yet. In part, this is because I don’t think the Saudis or the Israelis at the highest levels have come to clear answers about how to proceed from here. At the moment, I would lean towards agreeing with those who believe Israeli won’t take any military action during these next six months, but there are many factors I cannot see from this angle. I don’t want to see a scenario like the one I portrayed in Damascus Countdown unfold. I’d much rather see a diplomatic solution that truly worked. That said, I’m deeply concerned that the world powers just let themselves be hoodwinked by the mullahs in Iran, and that the world has suddenly become a much more dangerous place, with Iran in a better position to build and deploy nuclear weapons. There are many variables here. And there are likely to be many twists and turns on the road ahead. The best I can do is promise to keep you posted on developments as they unfold. Let’s keep praying for the Iranian nuclear threat to be neutralized peacefully, if at all possible. “We are not bluffing.” Israel ready to strike Iran alone, says Netanyahu’s outgoing national security advisor. (Jerusalem, Israel) — The plan is set. The air force has trained. Everything is in place. Should Prime Minister Netanyahu order a full scale attack on Iran’s nuclear facilities, the Israeli Defense Forces are ready to go into battle. They are ready to do so alone, without American or other allied support. And Israel will succeed. This was the message of Netanyahu’s outgoing national security advisor Yaakov Amidror in recent days, and it has Mideast analysts buzzing. Amidror, a devout Orthodox Jew and long-experienced intelligence analyst, rarely gives interviews and doesn’t do spin. When he starts speaking publicly about a possible Israeli preemptive strike and says, “We are not bluffing,” heads start turning and ears prick up. 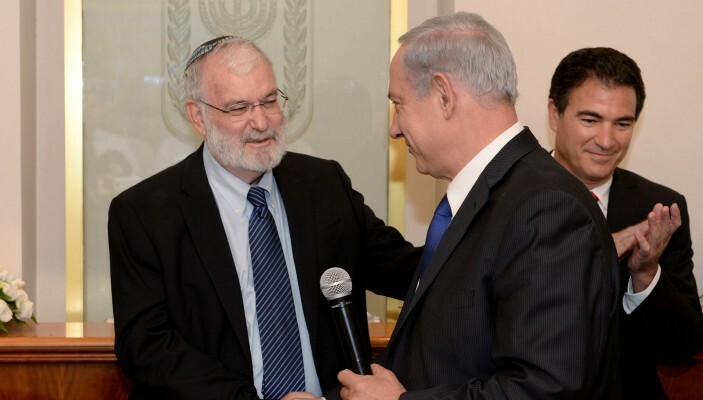 Personally, I believe Netanyahu recruited Amidror to help Israel prepare for this moment. Readers of this blog may recall that almost precisely three years ago — before Amidror was named national security advisor (February 2011) — he spoke at a conference in Washington, D.C. and said he fully expected a war with Iran. Now consider Amidror’s latest statements, given just as he is stepping down from government service after several intense and grueling years in the inner circle. “An Israeli strike on Iranian nuclear installations would halt Iran’s ability to produce nuclear weapons ‘for a very long time,’ said Yaakov Amidror who stepped down as Prime Minister Benjamin Netanyahu’s national security adviser last week,” reported Haaretz, picking up a “rare interview” Amidror gave to British newspaper the Financial Times. Amidror addressed the possibility an Israeli strike would trigger a response by Hezbollah, such as the firing of thousands of missiles toward Israel. In that case, Amidror said Israel would have to go on a ground assault into Lebanon and enter urban areas to stop the fire. A profound sense of dismay is spreading among the Israeli people that they are watching the sunset of the golden years of the U.S.-Israeli alliance. (Jerusalem, Israel) — A profound sense of dismay is spreading among the Israeli people. The slowly but steadily emerging consensus is that the American government is poised to cut a disastrous deal with Iran that could potentially endanger the State of Israel, and that the perhaps the White House cannot be trusted as the supreme ally it has been for seven decades. Sharp American critics of President Obama might be surprised that Israelis are only now coming to this conclusion. But keep in mind that most Jewish people tend to be left-of-center politically. They love Bill Clinton. They like Hillary Clinton a great deal. They had high hopes for Barack Obama. But those hopes have largely been dashed. Israelis were deeply grateful when President Obama made a state visit here in March. They hoped this represented a “reset” in U.S.-Israeli relations that have been strained over the last four or five years. Now they are not so sure. Could things change? Absolutely. Could the President and Secretary of State reject a bad deal with Iran and reassert American leadership on the global stage? Yes. Could they ratchet up sanctions on Iran? Sure. Could they demand Iran stop enriching uranium, dismantle all its enrichment facilities, and abandon every element of its nuclear weapons program or be subjected to every increasing sanctions and international isolation, and a real military threat? Of course. But while Israelis know these things could happen, they are beginning to conclude that they probably won’t. And they are stunned, and saddened. Israelis are now genuinely and increasingly concerned that they are watching the beginning of the sunset of the “golden years” of their deep alliance with the world’s only superpower. “A full 55 percent of Israeli Jews felt that the US cannot be relied upon to safeguard Israel’s security during the Iranian talks, with 31% saying the Americans could be trusted on the issue and 14% stating that they did not have an opinion on the matter,” finds a new poll published by the Times of Israel. On top of all that, now the Grand Ayatollah of Iran has said the Jewish State is “doomed to failure and annihilation” and said Israel is a “rabid dog” — right in the middle of the nuclear negotiations — and neither the U.S. or other world leaders (other than France) has publicly rebuked the Iranians. “Foreign Minister Avigdor Lieberman compared Khamenei’s rhetoric to that used by Nazi Germany,” noted Haaretz. “Whoever talks about the Jews using the terminology of Goebbels and Hitler certainly has no intention to develop a nuclear program for peaceful purposes,” he said. “We knew the Americans were eager, even more so than the Iranians themselves, to reach an intermediate deal in Geneva, but we did not estimate to how great an extent,” a senior official in Jerusalem told The Jerusalem Post’s Hebrew-language sister publication Sof Hashavua Magazine. These are sobering developments. But as Christians, we are not to fear the future. The Lord is sovereign. He sees these trends and they don’t worry Him. The God of Israel a loving and gracious plan and a purpose for the people of Israel, and the Palestinians, and all the people of the epicenter. “I know the plans I have for you,” says the Lord in Jeremiah 29:11, “plans for good and not for evil, plans to give you a future and a hope.” So let’s pray with hope and confidence that the Lord will never abandon His people or forsake them. He will shake them to get their attention and draw them to Himself. 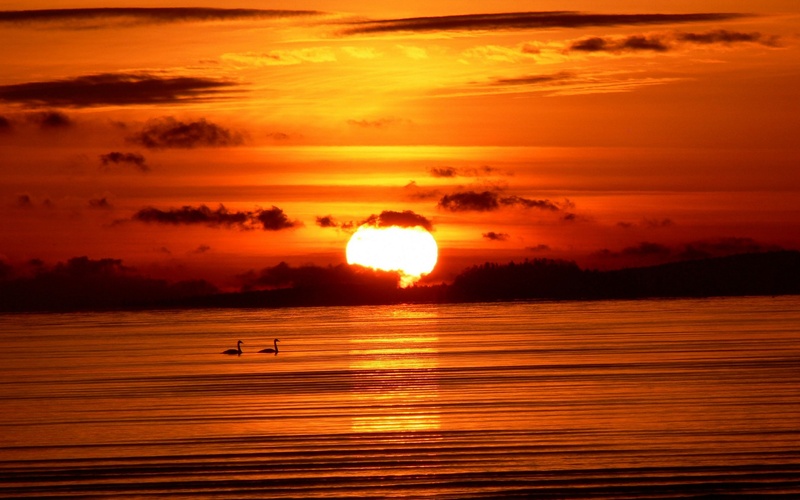 But the God of Israel is not asleep on the job. We can trust Him, come what may. Khamenei says “Israeli regime is doomed to failure, annihilation” as nuclear negotiations resume in Geneva. “Zionist officials cannot be called humans, they are like animals, some of them,” said Khamenei. “The Israeli regime is doomed to failure and annihilation,” he added. 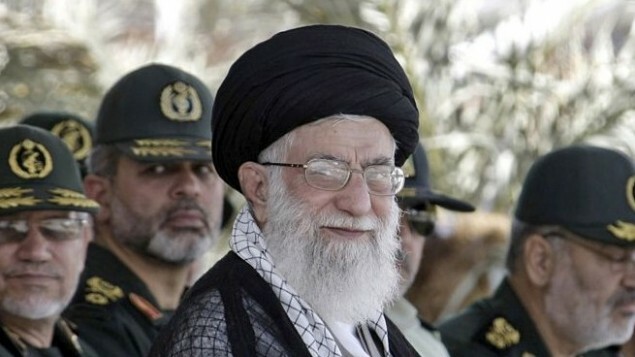 “The ‘Zionist regime’ says things that ‘only bring humiliation on themselves,’ he said adding that it is a regime that ’emerged through force and no phenomenon that has emerged through force has continued to exist, and this regime will not continue to exist either,'” the Iranian leader insisted…. “The leader also criticized France. French President Francois Hollande assured Israel on Sunday that France would continue to oppose an easing of economic sanctions against Iran until it was convinced Tehran had given up any pursuit of nuclear weapons,” noted the Post. The Times of Israel reported that “President Francois Hollande believes comments by Iran’s supreme leader about Israel are ‘unacceptable’ and complicate talks between world powers and the Islamic regime over its nuclear program,” according to a French government spokesperson. Netanyahu in Russia for talks with Putin on Iran nuclear negotiations. “[We] don’t expect that Russia will adopt Israel’s views [on Iran], but even a slight change in Russia’s position could affect the expected agreement between the [world] powers and Iran,” Elkin said…. Netanyahu invites Palestinian leader Abbas to address Knesset. Says he will go to Ramallah. French leader addresses Israeli parliament. (Jerusalem, Israel) — Israeli Prime Minister Benjamin Netanyahu made a bold gesture today in hopes of significantly advancing the peace process with the Palestinians: he invited Palestinian Chairman Mahmoud Abbas to speak at the Knesset (Israel’s parliament), and offered to visit Ramallah and speak to the Palestinian people and government. 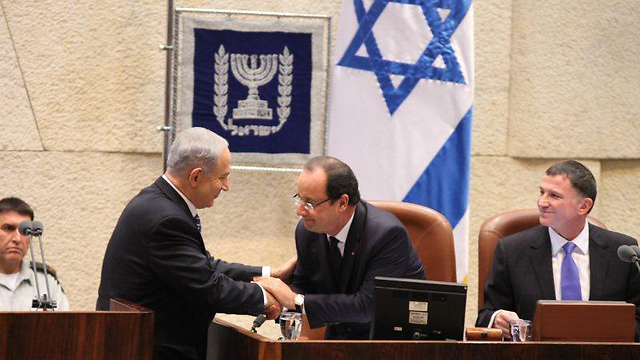 Netanyahu made the move during French President Francois Hollande’s second day in the Holy Land. Hollande spent part of the day visiting Abbas in the Palestinian capital of the West Bank. Later Hollande addressed the Knesset. During his speech, he insisted France would oppose a terrible nuclear deal with Iran. In the same speech, the French leader also called for Israel to divide Jerusalem and help make it a co-capital with the Palestinians. Here’s the latest coverage from Haaretz, a leading Israeli daily newspaper: “Prime Minister Benjamin Netanyahu invited Palestinian President Mahmoud Abbas Monday to address the Israeli parliament, and said he would be willing to visit Ramallah,” reports Haaretz. “Speaking at a special plenary session in honor of French President Francois Hollande’s visit to Israel, Netanyahu called on Abbas to “end the stalemate” between Israel and the Palestinians.”“I call on President Abbas to come here to the Knesset and recognize the relationship between the Jews and the Land of Israel,” Netanyahu said. “Hollande, who addressed the Knesset after Netanyahu, called on Israel to stop building settlements in the West Bank, saying that these were ‘hampering the creation of a Palestinian state,'” noted Haaretz. “The status quo with the Palestinians cannot last,” the French president said…..
Hollande expressed hope that France and Israel would warm ties, highlighting his hope for closer economic relations, especially with respect to the high-tech industry and cooperation between Israeli and French universities. Opposition leader Shelly Yacomovich (Labor) also spoke at the special Knesset session. During her remarks, Yacimovich said the opposition would support the Netanyahu government with any progress it makes in the peace process. Earlier on Monday, Hollande travelled to Ramallah where he met with the Palestinian leadership. There, he called on the Palestinians to show flexibility on the issue of the 1948 refugees’ “right of return,” and in exchange demand a halt to construction in the West Bank settlements as a way to make progress in the diplomatic talks. Hollande met with Abbas at the Mukata government compound in Ramallah, where he reiterated the French policy that Israeli construction in the West Bank should be frozen because the settlements are an obstacle to moving the peace process forward. However, he also told Abbas that during his conversations with Prime Minister Benjamin Netanyahu, the premier cited the refugee issue as one that was liable to make it difficult for the two sides to reach an agreement. “France opposes the settlements,” Hollande told a joint press conference after the meeting with Abbas. “Construction in the settlements must be stopped because it will make it more difficult to achieve a two-state solution and get the two sides back to the negotiating table,” he said, adding that the focus of his discussion with Abbas was the refugees issue.